Andrew believes each person is unique and because of this, he develops individualized treatment plans for each person to optimize their recovery. Andrew has experience dealing with a wide variety of injuries that can cause aches and pains and may slow you down. Physiotherapy with Andrew is right for you if you want to feel healthier, and continue to be active and do the things you love. Together we can achieve your goals, whether that goal is recovering from an injury or becoming pain free. Andrew Englander completed a Bachelor of Arts in Kinesiology with honours at The University of Western Ontario (UWO). While at the UWO, Andrew spent time working with the Western Mustangs wrestling team as their trainer. 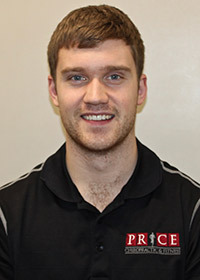 After graduating from UWO he went on to complete his Master’s in Physiotherapy at McMaster University. Andrew’s previous physiotherapy work experience includes working in outpatient orthopedic clinics, the critical care unit in a hospital and working in the integrated stroke unit at the Hamilton General Hospital. Over the course of his training, Andrew has attained additional education and training in the areas of soft tissue release, manual therapy, and acupuncture. In his free time, Andrew enjoys making and enjoying delicious meals, weight lifting, reading, back country camping, and playing tennis.